Witchy tale wows crowd at Boston Opera House. Jackie Burns and Chandra Lee Schwartz are Amazing in Wicked at the Boston Opera House. By now, seven years into the “Wicked’’ phenomenon, it is clear that this revisionist take on “The Wizard of Oz,’’ one of the most potent myths of the 20th century, has established a pretty potent 21st-century myth of its own. Boston Opera House is full with the response of the largely female audience to “Wicked’’. While it’s an uneven production, the reality is that each iteration of this musical rises or falls on the strength of its Elphaba, a.k.a. the Wicked Witch — and in Jackie Burns, this “Wicked’’ boasts an Elphaba who could go broom to broom against Idina Menzel herself. 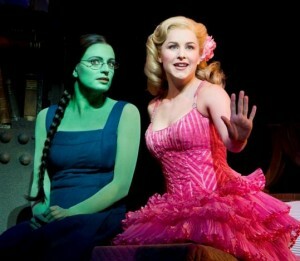 Whether she is belting out a truly stunning version of “Defying Gravity’’ to close the first act or cracking your heart by confessing, brokenly, that “I’m Not That Girl,’’ Burns brings a richness of emotional coloration to the role of the green-skinned outcast who discovers that she has supernatural powers. The rest of the cast does not match Burns’s level of radiant intensity, and there are some dead spots between the musical numbers. Chandra Lee Schwartz plays the other key role, Glinda as a kind of cross between Reese Witherspoon’s Elle in “Legally Blonde’’ and Teri Garr’s Inga in Mel Brooks’s “Young Frankenstein.’’ Luckily for this “Wicked,’’ Jackie Burns retains full possession of her powers of song, from start to finish. The company of the first North American tour of Wicked welcomes Jackie Burns as Elphaba on Thursday, July 8 in Houston, TX. Burns was most recently seen in the original cast of the Tony Award-winning Broadway revival of Hair, where she was part of the ‘Black Boys’ trio and understudied and performed the role of Sheila. 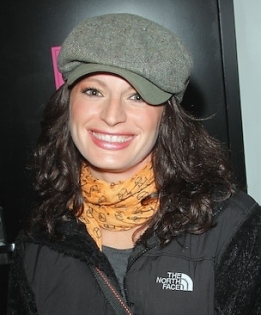 Off-Broadway she was part of the original company of Rock of Ages and the award-winning Unlock’d for NYMF. Burns joins a cast that includes Chandra Lee Schwartz as Glinda, Randy Danson as Madame Morrible and Richard Kline as The Wizard. The company also features Richard H. Blake (Fiyero), Justin Brill (Boq), Tom Flynn (Dr. Dillamond), Brynn O’Malley (Nessarose) and Mariand Torres (Standby for Elphaba) with Terra Lynn Arrington, Antonette Balestreri, Al Blackstone, Aaron De Jesus, Emily Ferranti, Dominic Giudici, Courtney D. Jones, Spencer Jones, Renee Lawless-Orsini, Philip Dean Lightstone, Kourtni Lind, Marissa Lupp, Sterling Masters, Kevin McMahon, Jeremy McQueen, Christopher Russo, Adam Sanford, Carla Stickler, Brandon Tyler, Shanna VanDerwerker, Bud Weber, Betsy Werbel, Lauren Ashley Zakrin and Jared Zirilli. The Houston engagement of Wicked is currently running through July 25 at the Sarofim Hall Hobby Center. Tickets are available online. Buy Wicked Sarofim Hall Hobby Center Tickets.